Like most countries, Canada collects duties on specific goods imported into the economy. Over the past 30 years, the value of Canada's imports from the world increased fourfold. Meanwhile, duties collected on imports declined from 3.7% of Canada's total import value in 1988 to 1.0% in 2017. Historically, higher duty values were collected on imports of vehicles, although these values fluctuated over the past 30 years depending on the mix of countries from where the vehicles were imported. Additionally, while duties on imports of goods from China and the United States were among the highest collected in Canada in 2017, duties on goods from these countries fell sharply from 1988 to 2017, particularly throughout the 1990s. In July and August 2018, surtaxes applied to imports of certain goods from the United States increased the value of duties on goods of US origin. In 2017, Canada's imports from the world totalled $561.4 billion, on which $5.7 billion in duties were collected. Duties as outlined in the Customs Tariff comprised the largest share of Canada's revenue on imports at $5.6 billion, while $45 million was generated from countervailing and antidumping duties. Duties are applied to specific goods categorized by the Harmonized Commodity Description and Coding System (Harmonized System or HS) Classification as outlined in the Customs Tariff. These are often a percent rate (such as 5%) applied to the value of the import, or a flat rate per unit (for example, $1.00 per dozen). In addition, certain goods may be subject to countervailing duties, antidumping duties or other subsidies as a result of special investigations by the Canadian Border Services Agency (CBSA) under the Special Import Measures Act. Imports of vehicles garnered the highest value of duties in 2017, followed by apparel and clothing, and footwear. Together, these goods accounted for half of the total value of duties collected on Canada's imports in 2017. Vehicles include vehicles for personal and commercial use as well as vehicle engines and parts. Duties collected on these goods totalled $951 million in 2017, or 1.0% of the total $96.5 billion in imports of these goods. Historically, the ratio of duties to the import value of vehicles peaked at 1.9% in 1991. 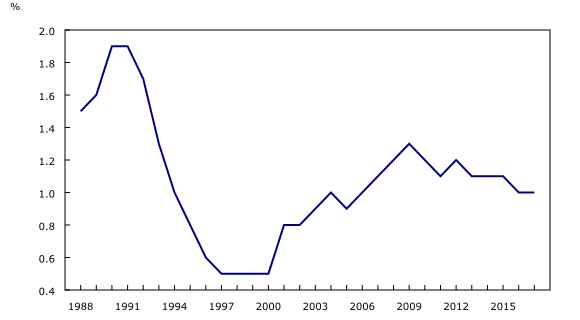 The implementation of the Canada-US Free Trade Agreement (CUSFTA) in 1989 and the subsequent North American Free Trade Agreement (NAFTA) in 1994 resulted in a decrease in this ratio, which fell to 0.5% by 1997 and remained consistent for several years. It increased again in the 2000s in tandem with Canada's increased imports of vehicles from non-NAFTA countries such as Germany, Japan and South Korea. 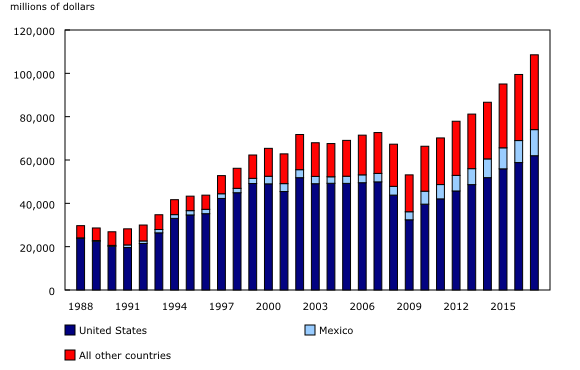 By 2009, the ratio rose to 1.3%, but fell again to 1.0% by 2017 as a result of higher imports from Mexico and the United States. In 2017, motor vehicles designed for the transportation of persons garnered the highest value of duties among all goods imported into Canada. Duties on these goods totalled $708 million or 12.4% of the total value of duties collected on Canada's imports in 2017. While half of the motor vehicles imported into Canada were of US origin, almost 70% of the duties collected were on Japanese and German vehicles. Canada imported $216 million in dairy products from the United States in 2017, which were subject to $3 million in duties. While 40% of the dairy products imported into Canada were from the United States, duties collected on goods of US origin accounted for 16.5% of the total duties on these goods in 2017. Half of the value of duties collected were on goods imported from New Zealand. Dairy products are an example of goods that are controlled through the tariff rate quota system where importers are allotted a quota on imports of certain products. When goods are imported within the quota, the duty rate is zero or low. When imports exceed the quota, they are subject to higher rates of duty depending on the product. Imports of cheddar cheese, for example, that fall within the allotted quota are free from duties for countries with preferential tariff agreements or otherwise are subject to a duty of 2.84 cents per kilogram. When cheddar cheese imports exceed the quota, the duty rate rises to 245.5% but not less than $3.53 per kilogram. Rates of duty outlined in the Customs Tariff for dairy products imported over the allotted quota ranged from 201.5% to 313.5% in 2017. Taken together, imports of dairy products with import controls, such as milk, yogurt and cheese, totalled $542 million, accounting for 0.1% of Canada's total imports in 2017. They were subject to $20 million in duties, a ratio of 3.6% to the total value of imports of these goods. Most imports were within the allotted quota. Imports over quota accounted for 5.0% of total imports of these goods and generated $17 million in duties in 2017. For above quota imports, the ratios of duties to import values ranged from 1.2% to 295.5%. When dairy products were imported within the allotted quota, the duty ratio did not exceed 7.0%. In 2017, the countries where Canada imported the highest value of goods were the United States, followed by China. The order is reversed when it comes to duty values: goods from China garnered the highest value of duties, followed by goods from the United States. Goods from Germany, Japan and Viet Nam also garnered significant duty values when imported into Canada. Canada's imports from China have grown steadily over the last 30 years, growing from 0.7% of Canada's total imports in 1988 to 12.6% in 2017. The value of duties collected on Chinese goods also increased, but not to the same degree as the import value. In fact, the ratio of duties to imports from China declined over the 30 year period, from 12.6% of the import value in 1988 to 3.3% in 2017. Canada imported $70.9 billion in goods from China in 2017 and collected $2.3 billion in duties, or 40.9% of Canada's total value of duties collected. The highest values in duties collected on goods from China were apparel and clothing, furniture, footwear, and textiles. Together, these goods accounted for 61.6% of the total value of duties collected on Chinese goods. 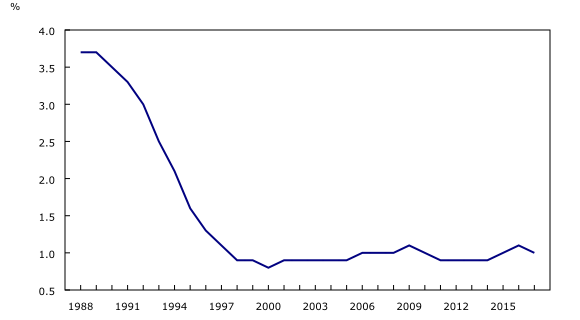 With the United States being Canada's largest trading partner, the implementation of CUSFTA and subsequently NAFTA had a notable impact on the decline in duties on US goods over the past 30 years. In 1988, Canada collected $2.2 billion in duties on imports from the United States, which was 2.6% of the import value. By 2017, the value of duties declined to $562 million or 0.2% of the import value. Meanwhile, the value of Canada's imports from the United States more than tripled. 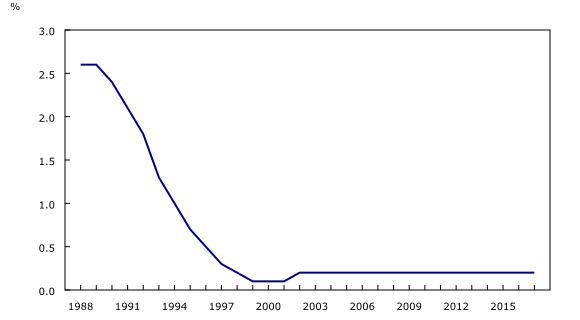 The most notable decline in the ratio of duties to imports from the United States occurred from 1989 to 1998. Over this period, the ratio fell from 2.6% to 0.2%. At the same time, the value of Canada's imports of US goods more than doubled from $88.1 billion to $203.6 billion. In 1988, the year prior to the implementation of CUSFTA, the value of Canada's imports from the United States was $86.0 billion, with $2.2 billion in duties collected. The highest values of duties were collected on imports of computers and computer peripheral equipment at $61 million. Duties on US goods fell sharply following the implementation of CUSFTA and NAFTA. By 1998, $344 million in revenue was generated on $203.6 billion in imports from the United States. The highest values of duties were on imports of cigarettes and beer. In 2017, goods imported from the United States through the CBSA's courier shipment program garnered the highest value of duties at $217 million. In 2018, the United States applied additional duties to steel and aluminum products imported from Canada, among several other countries. Canada responded with surtaxes on steel and aluminum products as well as numerous products, ranging from sauces and condiments to appliances and lawnmowers. For each month from January to June 2018, duty values accounted for 0.2% of Canada's value of imports from the United States. This ratio increased to 0.7% in July and to 0.8% in August. On average, Canada collected $45 million in duties per month from January to June 2018. The implementation of supplementary tariffs on US goods in July increased the total value of duties collected to $173 million in July and $198 million in August. In comparison, the United States collected an average of $25 million in duties per month on imports of Canadian goods from January to May 2018. With the application of tariffs on imports of Canadian steel and aluminum in June, this rose to $237 million in both June and July and $239 million in August. The ratio of duties to the value of US imports of Canadian goods was 0.1% from January to May, and rose to 0.6% in June and 0.7% in July and August. As noted, the surtaxes implemented by Canada on imports from the United States in July 2018 included steel and aluminum products as well as a number of other products. Some of these goods were already subject to tariffs as outlined in the Customs Tariff. In July 2018, the highest value of duties was collected on imports of aluminum alloy plate in sheets or strips at $11 million. Other products with higher values of duties in July 2018 were flat rolled products of iron or steel, plated or coated with zinc, and iron or non-alloy steel casing or tubes, pipe and hollow profile. The three products with the highest duty rates were the same in July and August. In August, tariffs and duties collected on imports of aluminum alloy plate in sheets or strips totalled $14 million, which is higher than July based on increased overall imports of this product from the United States. Imports of sauces and preparations and mixed condiments and seasonings had higher values of duties in July ($4 million) and August ($5 million). Duties on toilet paper, tissues, and towels of paper totalled $4 million in both months, and on aluminum containers not exceeding 300 litres, they totalled $3 million in both months. Duties on not decaffeinated, roasted coffee were $3 million in July and $4 million in August. This review of Canada's import duties over the past 30 years provides insight into fluctuations in the value of duties collected on imports, the goods on which duties were collected and the countries from which these goods were imported. It also provides a view into the effect of free trade negotiations on the ratio of duties to imports over time along with the impact of the recent application of supplemental surtaxes. In light of these recent surtaxes as well as current and future negotiation of free trade agreements, the duties collected on Canada's imports will likely continue to change over the coming months and years. The Canadian international merchandise trade data presented in this report are on a customs basis and are not adjusted for seasonality. "Duties" represent the values collected based on the tariff rates applied to imports classified under the Harmonized System as outlined in the Customs Tariff as well as the values collected based on the goods subject to countervailing duties, antidumping duties or other subsidies under the Special Import Measures Act. The values of duties were reported by the importer on Canada Customs Coding Forms when goods were presented to the Canadian Border Services Agency (CBSA) for import into Canada. More information can be found on the CBSA's website. The values of duties included in this report do not necessarily represent the amounts of duty paid. The data in this report conform to international standards for the compilation of international merchandise trade statistics. As such, these data do not include imports considered out-of-scope for inclusion in trade statistics; the duty values reported for out-of-scope imports are therefore excluded from the values quoted. Generally, Statistics Canada's international merchandise trade data are subjected to processes for error detection, edit and imputation, and quality evaluation. While the data on Canada's import values – both overall and by commodity or country – are subject to these processes, the data on duties have not been subjected to the same level of scrutiny. Additionally, revisions or corrections may be made to certain fields in a transaction record without associated changes reflected in the duty value. The ratio of duties to imports is calculated by dividing the value of imports by the value of duties; it is expressed as a percentage. In this report, dairy products subject to import controls include all HS codes in chapter 4 of the Customs Tariff excluding the following: HS0404.10.10.00; all HS codes under 0404.10.90; and all HS codes from HS 0407 to 0410. The United States Census Bureau's international trade statistics, as published on October 5, 2018, were converted from US dollars to Canadian dollars using the Bank of Canada's monthly average of the daily end of day exchange rate. The United States Census Bureau provides the following note with regards to the "calculated duty" data: "Estimates of calculated duty do not necessarily reflect amounts of duty paid and should, therefore, be used with caution. The inclusion in the figures of some U.S. products returned after processing and assembly abroad, for which a portion of the value is eligible for duty free consideration, may cause these duty figures to be somewhat overstated as a result. In cases where articles are dutiable at various or special rates, a dutiable value is shown but no duty is calculated. Thus, there is an understatement in the estimates of calculated duty to the extent that these situations exist." Data on Canada's imports and duties and the ratio (percent) of the value of duties to the value of imports are now available as part of the Just the Facts series. Customs-based international merchandise trade data are available in the Canadian International Merchandise Trade Database (Catalogue number65F0013X). For more information, or to enquire about the concepts, methods or data quality of this release, contact us (toll-free 1-800-263-1136; 514-283-8300; STATCAN.infostats-infostats.STATCAN@canada.ca). To enquire about the concepts, methods or data quality of this release, contact Nita Boushey (613-404-4965; nita.boushey@canada.ca), International Accounts and Trade Division.